This plant has a unique curl in the foliage unlike any other pepper. 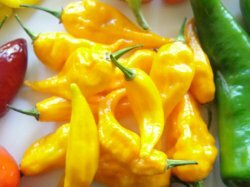 One of the hottest peppers from Africa, the fatali are hotter than a habanero, but have their own unique shape, flavor, and color. I think this variety is at a similar heat scale or hotter than the bhut jolokia (ghost pepper), just hasn't been scientifically tested yet.